Red Riding is a trilogy of feature films, released simultaneously, that uncover murder and pervasive corruption in Yorkshire, England in different time frames—1974, 1980 and 1983. Each film has a different director who employs a different visual style and each film is self-contained, but 1980 and 1983 build on events from earlier parts of the series. With uniformly high quality, the three films make up a gripping mystery that should keep audiences curious enough to continue with the series to find out the eventual resolution. With critical attention the films could become a cult series, but the grim subject matter could limit audience size. The trilogy is based on a quartet of novels by David Peace. For financial reasons, the 1977 book was eliminated from the adaptation. Tony Grisoni (In This World), who wrote all three screenplays, has accurately described Red Riding as “Yorkshire Noir” and “Dickens on bad acid.” Each film in the trilogy is dense with complex characterizations and interconnected details. Tension is sustained throughout. The acting ensemble is top-notch. The shooting schedule of the films overlapped at times and actors would travel between locations to shoot a different installment of the story, each time moving into a different era. Yorkshire has the bleak atmosphere of economic uncertainty. Director Julian Jarrold (Brideshead Revisited) shot the first film in 16mm for a “grainy” quality to reflect the gritty texture of the setting. In 1974, a young girl, Claire Kemplay, has disappeared. 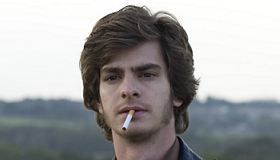 Instead of attending his father’s funeral, young crime reporter Eddie Dunford (Andrew Garfield, Lions For Lambs), attends a press conference in which Claire’s mother appeals for help. Eddie has had an undistinguished life and attempts to prove himself as a journalist. He examines links between Claire and other girls who have also disappeared. Trying to interview the parents of the girl whose been missing the longest, Eddie angers his editor by missing out on the big story of the discovery of Claire’s body on the property of a construction site owned by John Dawson (Sean Bean, Lord of the Rings), a wealthy businessman. Bean brings a confident swagger to Dawson who attempts to control all parts of Yorkshire. Shocking details about Claire’s death emerge: she was tortured and raped and swan wings were stitched to her back. Some characters appear throughout the series. 16 year old Leonard Cole (Gerard Kearns), who finds Claire’s corpse, will be part of the case in 1983. Martin Laws (the always welcome Peter Mullan), the local vicar who is with Leonard during his 1974 interview, will have increased prominence in future episodes. BJ (Robert Sheehan), the damaged young man who is an informant in 1974, will be a surprise eyewitness in 1980. In 1983, BJ will provide crucial information on the identity of “the Wolf” who is pivotal to the Yorkshire crimes. Director Jarrold focuses on the characters. 1974 is the best of the trilogy because Eddie’s attempt to pursue crime leads and improve his own reputation is the strongest of the central investigations. Eddie’s personal story is as engrossing as the mystery he tries to solve. Garfield’s Eddie has a dogged determination, even when threatened and beaten by policemen. Throughout Red Riding, the police try to stop the truth from being revealed, and with it their unsavory connections. Detective Chief Superintendent Bill Molloy (Warren Clarke), nicknamed the Badger, is a particularly sinister member of the force. Eddie becomes involved with Paula Garland (Rebecca Hall, Vicky Christina Barcelona), the widowed mother of another missing girl. Hall is superb as the grieving mother, giving a standout performance of raw emotional pain. Even she has a connection to Dawson. For1980, director James Marsh (Man on Wire) filmed widescreen to facilitate dialog scenes with multiple characters. This second part is effectively organized in the style of a police procedural. At this point in the saga, The Yorkshire Ripper’s killings of young women have lasted six years and the local police haven’t been able to determine the Ripper’s identity. Peter Hunter (Paddy Considine, In America) of the Manchester Police is assigned by the Home Office to head a probe of the Yorkshire police. Peter is married. His professional life is further complicated by his personal relationship with Helen Marshall (Maxine Peake), a detective who accompanied him from Manchester. Peter finds evidence that may be tied to the events of 1974 but his inquiry is hindered by other policeman and he finds himself increasingly threatened by them. The third director, Anand Tucker (And When Did You Last See Your Father? ), shot his chapter in widescreen using the new Red Camera for “a very cinematic feel, within the constraints of the budget.” In 1983, Yorkshire is described as an area of “controlled vice.” One man with power says, “We do what we want.” Another schoolgirl has disappeared. Her case is compared to Claire Kemplay from 1974. The current Detective Chief Superintendent, Maurice Jobson (David Morrissey), “the Owl,” had worked on the Kemplay case with his then superior Bill Molloy. John Piggott (Mark Addy) is a lawyer without an office, he’s described by Addy as “a bit of a loser.” Addy is impressive in a dramatic change of pace from his comedic roles as in The Full Monty. When Piggott returns to his mother’s house after her death, a neighbor, Mrs. Myshkin, appeals to him to help her son Michael who had been arrested for the murder of Claire Kemplay. Michael was told to plead guilty by his lawyer. Piggott also tries to aid Leonard Cole from 1974 who is an arrested suspect. Jobson sees a medium for clues on the latest disappearance. He finds links between characters from 1974. Torturing suspects has been routine behavior in the Yorkshire force. As in the earlier periods, the sordid details of a decayed society are unflinchingly detailed. Jobson discovers that the corruption of which he has been a part is deeper than he had believed. Piggott’s and Jobson’s searches converge for a moving conclusion to a unique and rewarding multi-part film experience. Running time: 1974 -106 min. ; 1980-97 min. ; 1983-102 min.